This is a perfect recipe to serve in a bowl, comforting and delicious. The crunchiness of the sweet potato with the super soft and garlicky cashew cream sauce is a match made in heaven and you can add your favourite veggies to the mix, making it a balanced meal. 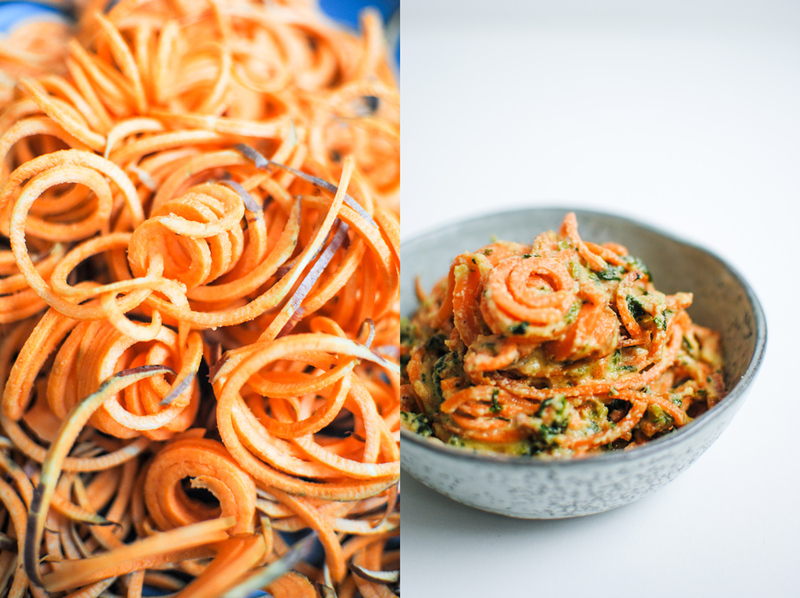 I used a spiralizer to make my noodles but you can also use a julienne peeler, a regular peeler (you’ll make tagliatelle noodles) or a good chef’s knife, cutting the sweet potato in very thin strips. If you follow me on Instagram (what?! C’mon… Here.) you probably have noticed my love for eating in bowls. I mean, is there anything as cozy as fitting the bowl in one hand, a spoon/fork in the other and appreciating all the different flavours and textures in one dish? So, this is bowl material but also looks – and tastes – great as a side dish for a family or friends’ dinner. I made this dish last week, once again, for my girls’ get together and they absolutely loved it, asked me for the recipe (here you go) and had seconds until it was finished. 1. Soak the cashews in hot water for, at least, 30 minutes. 2. 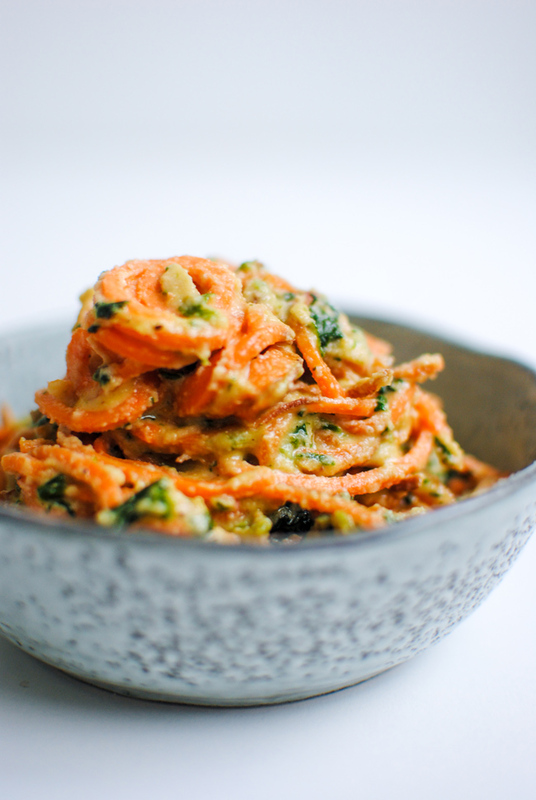 Spiralize the sweet potato and set aside. 3.Heat a medium pan oven high heat, add 1 tbsp olive oil and your spinach leaves. Wait 1 minute until they start to wilt down and add the sweet potato noodles. Lower the heat and stir to combine while cooking the noodles. In the mean time, blend your Cream Sauce ingredients until a very smooth liquid consistency. 4.Add the sauce to the pan and toss gently for 1 minute. 5.Taste, adjust your seasonings and it’s ready to go! Show me your recipes by tagging them on instagram with #pleaseconsiderfood. Que aspecto delicioso! E eu que adoro batata doce. Acho que temos refeição nova cá em casa. Espero que gostem 🙂 Eu acho que é deliciosa! Quanto tempo para cozinhar a batata doce al dente?